I served these scones as an accompaniment to another recipe from A Modern Cook's Year: More than 250 Vibrant Vegetarian Recipes to Get You Through the Seasons, which I will discuss below. It was a good decision because these are not very sweet, but add a nice contrast to the dish I prepared. I didn't have quite a full cup of spelt flour so I used a little bit of all-purpose in the same amount, and it worked just fine. You can actually substitute all-purpose flour entirely, but the texture will be a bit denser. Soak the dates in the hot tea for 15 minutes, until the tea has cooled a little. Mix together the flour, baking powder, allspice, and sea salt with your fingertips, then add the butter until the mix looks like bread crumbs. You could also do this by pulsing it in a food processor. Drain, then roughly chop the dates and add them to the mix, along with the molasses and buttermilk. Mix slowly and lightly until the mixture forms a soft but not too sticky dough. Shape into a rough round ball, place on a prepared baking sheet, and use a knife to score across the top, to mark out six portions, stopping before the knife reaches the baking sheet. It should look a bit like a loaf of soda bread. 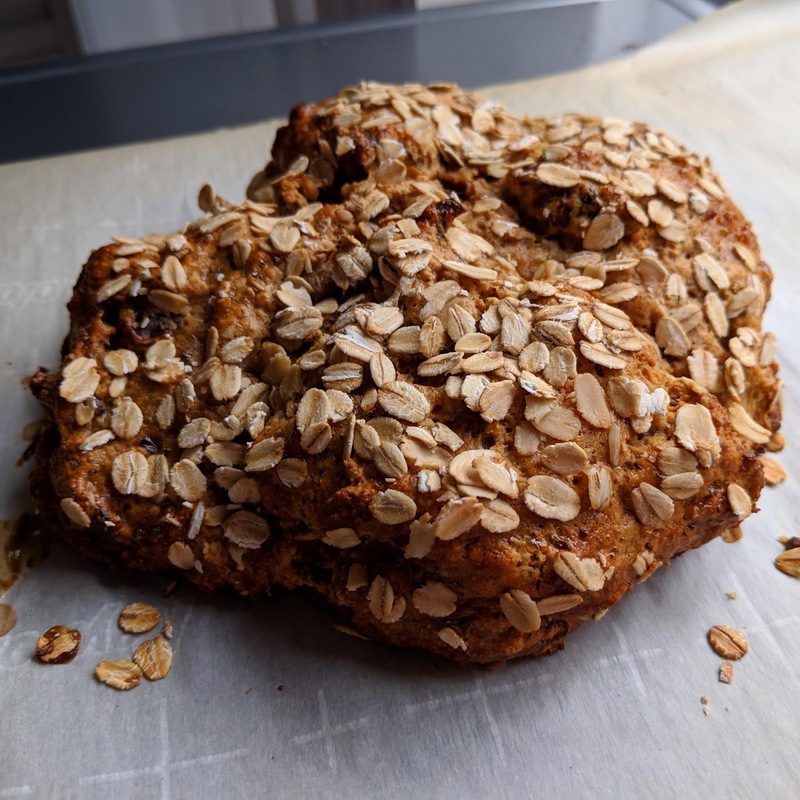 Mix the egg and milk for the glaze with a pinch of salt and brush it over the top, then sprinkle with the oats, pressing them into the dough lightly to stick them down. Bake for 15 minutes, then turn the baking sheet and reduce the heat to 360 F (180 C) and continue to bake for about 10 more minutes, until the top is a dark golden brown and when you turn the scone over and tap it, it sounds hollow. Serve warm from the oven and break up as required. I served this scone loaf with Cauliflower rice with eggs and green chutney from the same cookbook. As skeptical as I have been about cauliflower pretending to be other things, this treatment of it was delicious and we will have it again! 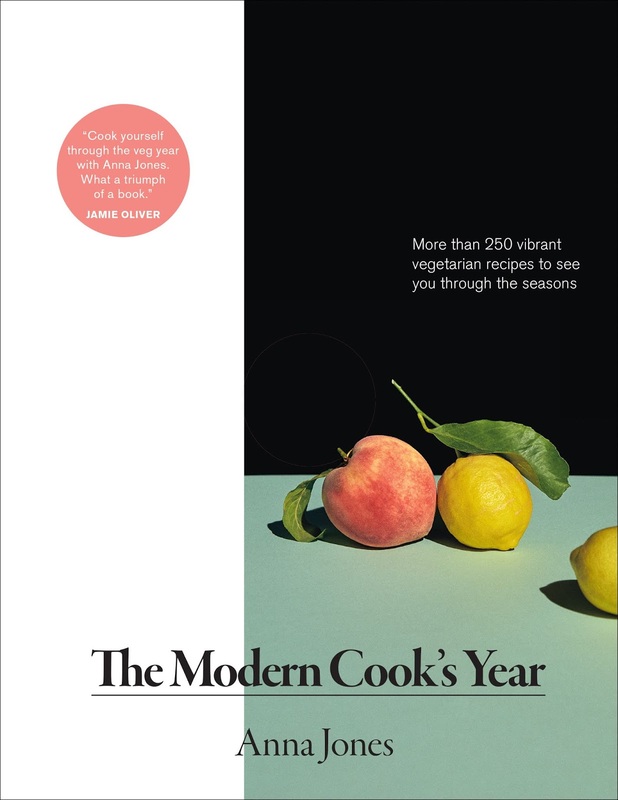 A Modern Cook's Year: More than 250 Vibrant Vegetarian Recipes to Get You Through the Seasons by Anna Jones is one of the books from ABRAMS that I've been procrastinating on because it has so many recipes I want to make! As a former vegetarian still married to one, I know the suffering of most vegetarian options at restaurants and even the offerings in vegetarian cookbooks - so many pastas, and so many portabella "steaks." This cookbook comes from a different philosophy. First of all it is very seasonal, but it is also British in all the best ways. 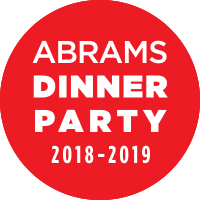 The recipes feel like they come from a country garden with rotating seasonal produce but also influenced by current eating trends and international cuisines. Sometimes Anna Jones provides a recipe, but other times she provides a formula. There are two pages of curry formulas that I can't wait to try, and the springtime dishes have me searching for ramps already. This is definitely going on my permanent shelf for endless inspiration. 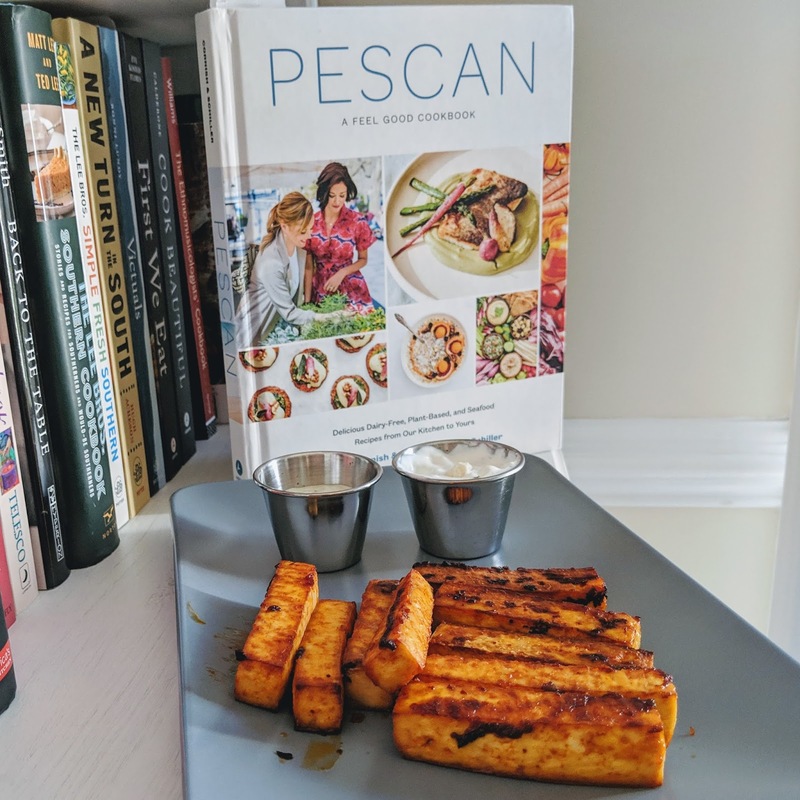 I made Spicy Buffalo Tofu Fingers from the Pescan Cookbook last month, but I had a few more pages marked to try. One morning we had berries in the fridge and bananas that were past their prime, and I remembered this recipe. Make the spiced berries. Place the blackberries, raspberries, and water in an 8-inch pan. Cook the berries over medium heat, stirring occasionally, until the raspberries begin to break down, about 3 minutes. Stir in the maple syrup and cardamom, lower the heat to medium-low, and cook for about 3 minutes more, until the raspberries have broken down into a sauce. The blackberries may stay intact depending on how firm they are. The sauce will continue to thicken as it sits. Make the pancakes. 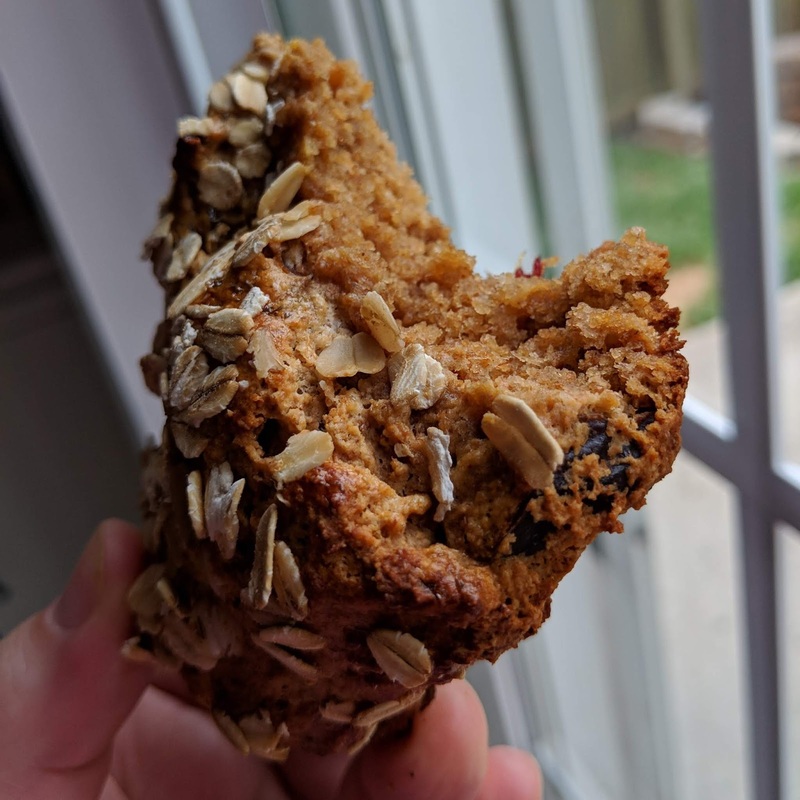 In a blender, combine the bananas, milk, water, oats, almond meal, baking powder, vanilla, cinnamon, salt, and chia seeds or egg. Blend, starting on low, then bringing it up to medium-high speed, until smooth, 30 seconds to 1 minute. 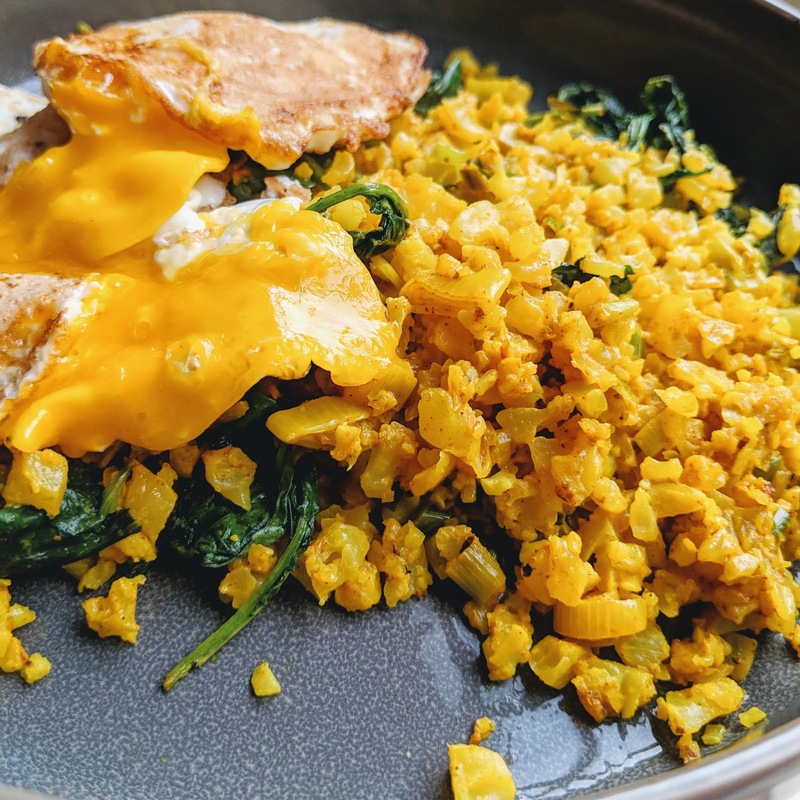 Heat a large nonstick skillet or griddle over medium heat, add 1 tsp of the coconut oil, and swirl to coat the bottom of the pan. When the pan is hot, after about 1 minute, make 2 pancakes using half of the batter (about 1/2 cup each), spreading the batter out with the back of a tablespoon. Cook until set on the bottom and a few bubbles appear on the surface, about 2 minutes, then flip and cook on the second side until lightly browned on the bottom, about another 2 minutes. Transfer the pancakes to a plate. Swirl the remaining teaspoon oil into the pan and repeat with the remaining batter. Meanwhile, reheat the berry sauce over medium-low heat. Transfer the pancakes from the pan onto individual serving plates and top each with one quarter of the berry sauce. 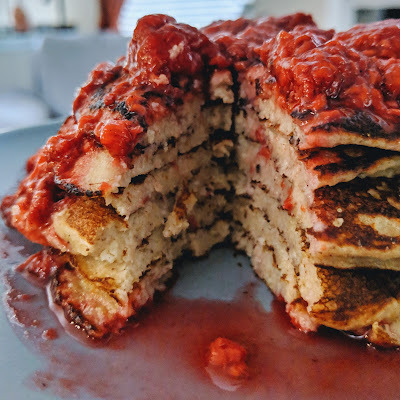 Reheat the first two pancakes in the pan over medium heat for 30 seconds per side, then transfer to serving plates and top with the rest of the berry sauce. Finish with a bit of softened coconut butter on top. Pescan is available March 26, 2019. I received a review copy of this cookbook - Cake Confidence by Mandy Merriman - from the publisher through Edelweiss. I was excited to look through it because I have followed the baker in Instagram for a while now (@bakingwithblondie) where you can watch videos of her perfect cake decorating. 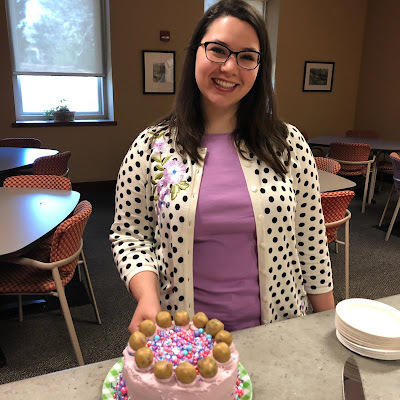 My cake decorating is not so perfect, and I didn't have all the supplies on hand that she uses, but I still made a delicious cake to celebrate a staff member's pending new job at another library. I picked this for her because she wears a lot of vibrant colors and although she is an adult, she is younger than the rest of us, so cookie dough and sprinkles made sense to me. I added a bunch of notes to the end of this post about the changes I made. Pictures are of my cake; definitely check out the more perfect and taller version in the cookbook itself! Preheat the oven to 350 degrees. Prep 6-inch cake rounds with a wipe of shortening and dust of flour. Set aside. In a medium bowl, whisk together the buttermilk, sour cream, vegetable oil, egg whites, and vanilla until combined. Sift in white cake mix and sprinkles and stir until just combined. Don't overmix! Bake for 25-27 minutes until center is baked through - don't overbake! Remove from oven, let cool in pan for 5 minutes, then flip out onto a cooling rack until room temperature. After the cake is finished baking, clean out the pans you used for the cake rounds, and press two layers of plastic wrap in an "x" in two of the pans, remembering to press the plastic wrap into the corners, and leaving about a few inches of overhang on all sides. Set aside. This will help you shape the cookie dough layer into the same size round as your cake. In the bowl of your stand mixer fitted with the paddle attachment, cream the butter and sugars together until light and fluffy, which should take about 3 minutes. Add the milk and vanilla and mix for about 30 seconds. Add in the flour, salt, chocolate chips, and jimmies. The dough will be slightly sticky. Add in flour by the tablespoon as needed. Roll the dough into tiny balls (think marbles or a tad larger) for the top decor of your cake. Store those in a plastic bag or small Tupperware with lid. Set aside. Divide the remaining dough into two separate balls and press one ball in the two prepared cake pans. Using the bottom of a 1 cup measuring cup or the bottom of a drinking glass helps a lot! The dough should be 1/4-1/2 inch thick. Wrap the overhang over the dough and refrigerate for at least 20 minutes. In a small glass bowl, add in chocolate melts and heavy cream. Microwave for 30 seconds, then stir with a small whisk until smooth. Add to a squeeze bottle for ganache drip on the side of the cake. In a stand mixer fitted with a paddle attachment, whip up butter for about a minute until light and fluffy. Scrape down the sides of the bowl. Add the salt, vanilla, and heavy cream until combined. Slowly add in powdered sugar, about a half cup at a time. Add in more heavy cream if needed for a thinner consistency. Add in pink coloring if desired. Whip on high for 1 minute to create a soft buttercream. On a cake turntable, tape a 6-inch cardboard round on top of an 8-inch cardboard round. Top with a small amount of buttercream and spread it around to act like "glue" for holding the cake onto the board. Place on first cake round and carefully top with the first cookie dough layer. Add on about a cup of buttercream, spread it flat with an offset cake spatula. Add on next layer of cake, and repeat with remaining two layers. Crumb coat the cake, place in the fridge to set for about 5 minutes. Add sprinkle rim on the bottom, freeze for a minute or so to set, then add on ganache drip. Place the cake in the freezer for 5 minutes to allow the ganache to firm before adding on the buttercream decor and topping them off with cookie dough balls. I don't have 6" cake rounds. I baked this cake in 2 9" cake rounds and made only one cookie dough layer. I made my tiny balls too big so almost didn't have enough for that layer. Because of time, even though I had the ingredients, I skipped the white chocolate ganache step. I had ordered a set of Fancy Sprinkles, so had to separate them out a bit before using them in this recipe. 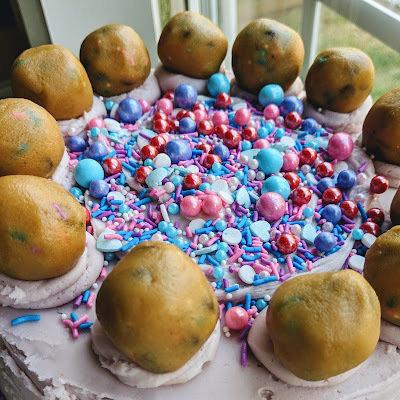 I tried to keep the tiny balls and jimmies for the cake batter and cookie dough and used the larger pieces on the outside and top. I do not like this buttercream and if I made this cake again would use one of my old standbyes that have a more silky texture. Once you go Italian/Swiss buttercream there is just no use for powdered sugar buttercreams in my opinion. 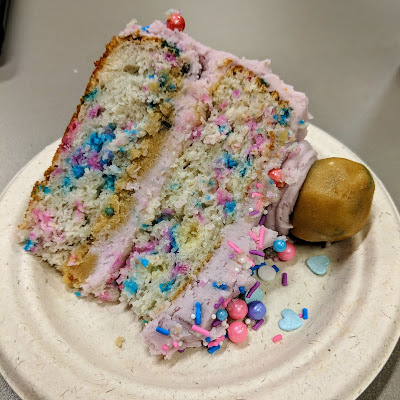 Even with all my modifications and less than perfect execution, this was hugely popular among my co-workers, who called it a unicorn cake and princess cake. The cookie dough inside really is a treat. A southern restaurant chain used to have buffalo tofu on the menu, and we would drive out of our way just to have some. A few years later they opened a restaurant in our town, but by then, they had removed the buffalo tofu from the menu. 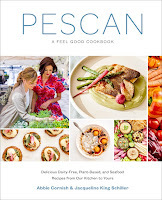 As I looked through Pescan: A Feel Good Cookbook by Abbie Cornish and Jacqueline King Schiller, several recipes caught my eye, but when I hit this recipe in the last section ("Party Food,") I knew what I would try first. The entire cookbook is plant-based and dairy-free (with the addition of seafood in some of the recipes.) I did not make the Avocado Ranch Dressing they have listed with this recipe because I did not have immediate access to nutritional yeast at my grocery store (this is still considered a specialty ingredient here in the south.) Instead I bought commercial Avocado Ranch that does contain dairy, and also made a sour cream blue cheese dip since that is what I think of with buffalo flavor. Please consult the cookbook for that part of the recipe. Tofu can sometimes be a struggle, and I've had a hard time bringing flavor into baked tofu. I really like the technique in this recipe, and would probably adopt it with other marinades/sauces as well. The only step I added was using my tofu press to remove even more moisture from the blocks of tofu. Preheat the oven to 400 F and line a baking sheet with parchment paper. Cut the tofu into fingers about 3/4 inch wide on all side and 3 inches long. Lay the fingers on the baking sheet so there is a little space between each one and bake for 15 minutes. Meanwhile, in a small pot, melt the oil over medium-low heat. Add the hot sauce, sriracha, and honey and whisk to combine. Turn off the heat. Remove the tofu from the oven and brush with the sauce on all sides. Bake for 15 minutes more. Turn the tofu fingers in the oven and brush with any remaining sauce. Bake for a final 15 minutes, or until lightly browned. 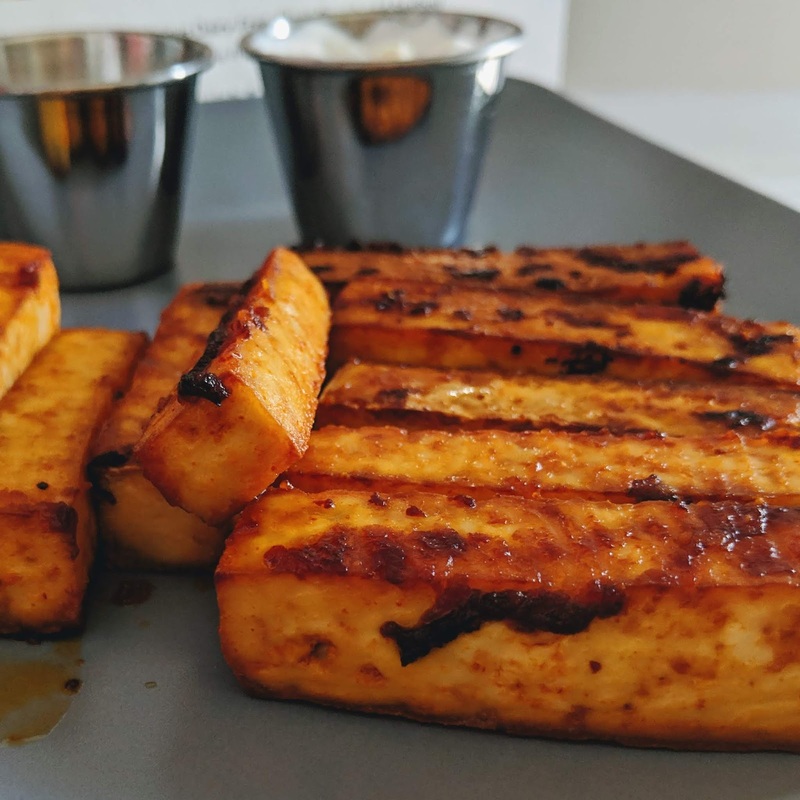 If the tofu has not browned after 45 minutes, you can place it under the broiler 2-4 minutes before serving. *The cookbook is plant-based and dairy-free but I'm noting that honey is still present. If you are completely vegan you of course will want a different ingredient here, maybe molasses or agave. I like this way of cooking, and having seafood in the mix means the recipes include everything we eat in my house. The pictures in the cookbook are vibrant and really invite you in. Some seem to require a better juicer/blender than I have, and I would probably be more likely to buy nut milks than make my own, but I like the from-scratch mentality for sure. 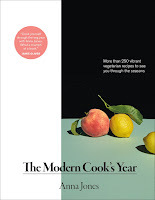 I recently read Save Me the Plums: My Gourmet Memoir by Ruth Reichl (this comes out on April 2,) about her years as Editor in Chief at Gourmet Magazine. It fits nicely between her other memoirs, and goes up until Conde Nast closes the magazine with little warning. Early on in her time there, as she was building relationships with the staff, they were working on a chocolate cake recipe for a YAFI (or a "You Asked For It") feature. She recognized the cake and was able to show them she really knew her stuff in that moment. Of course I wanted to make the cake. It's a bit of an unusual technique, with boiling fats, water, and cocoa powder together first, then mixing those with sugar and chocolate, then letting the batter cool before doing more with it. I didn't have a high enough round pan so I baked it in an 8" square, and it worked just fine. This recipe is more of a one-shot, make for a dinner party cake. 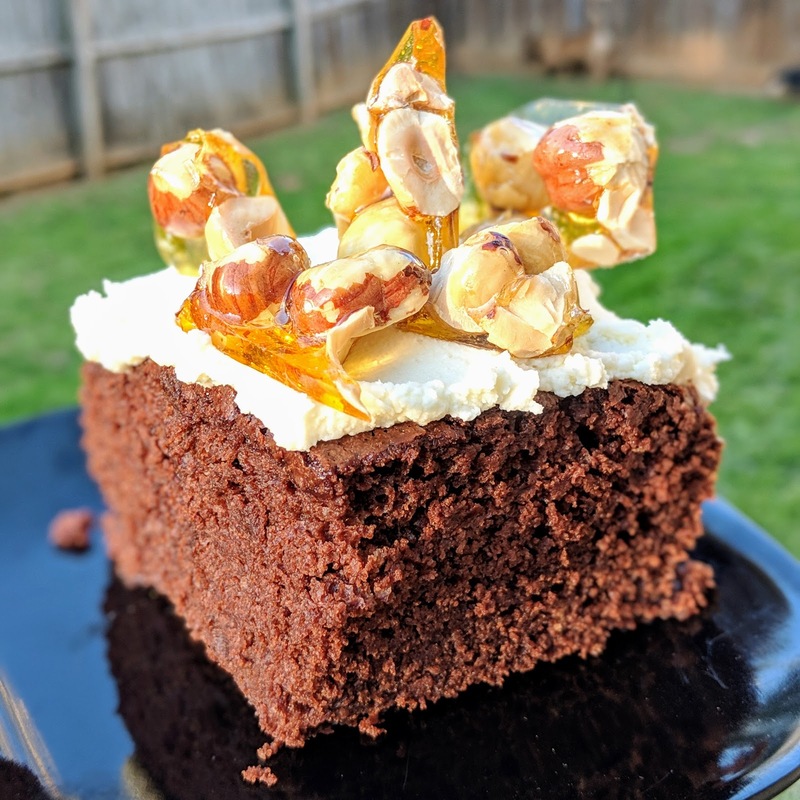 If you assemble it too early, the praline will go soft, the mascarpone will need to be chilled, and the cake will dry out in the fridge. To bring it to my co-workers tomorrow, I'll bring everything separately. In a baking pan toast nuts in one layer in middle of oven 10 minutes, or until almonds are lightly colored and hazelnut skins are blistered. Wrap nuts in a kitchen towel and let steam 1 minute. Rub nuts in towel to remove any loose hazelnut skins (do not worry about skins that do not come off) and cool completely. Line a baking sheet with foil. In a small heavy saucepan bring sugar and water to a boil, stirring until sugar is dissolved. Boil syrup, without stirring, washing down any sugar crystals that cling to side of pan with a pastry brush dipped in cold water, until it begins to turn golden. Swirl pan until syrup is deep golden and remove from heat. 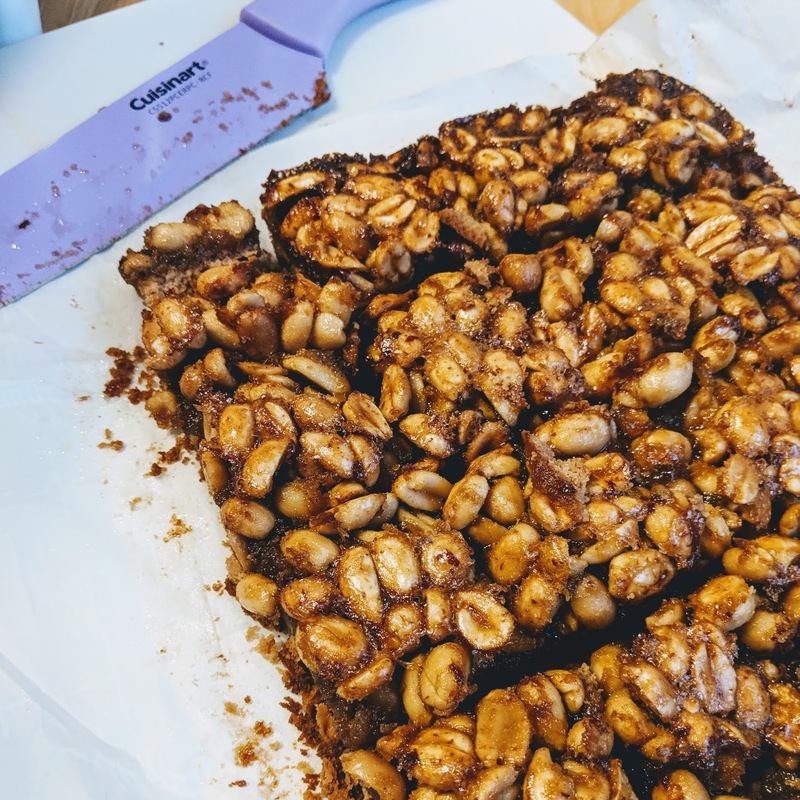 Stir in nuts and pour praline onto baking sheet, spreading evenly. Cool praline completely and break into pieces. Transfer praline to a sealable plastic bag and with a rolling pin coarsely crush. Preheat oven to 300°F. Generously butter a 9-inch round cake pan (at least 2 inches deep) and line bottom with wax or parchment paper. Butter paper and dust pan with flour, knocking out excess. Finely chop chocolate. In a small saucepan combine cocoa powder, butter, oil, and water. Bring mixture to a boil, stirring until smooth, and remove pan from heat. Add chocolate and sugar, whisking until smooth, and transfer to a bowl. Cool chocolate mixture completely and whisk in egg. Sift flour and baking powder over chocolate mixture and whisk until just combined. Whisk in buttermilk and pour batter into cake pan, spreading evenly. Bake cake in middle of oven 45 to 50 minutes, or until a tester comes out clean, and cool in pan on a rack 5 minutes. Run a thin knife around edge of pan and invert cake onto rack. Discard paper. Cool cake completely and transfer to a plate. In a bowl stir together mascarpone and sugar. Spread mixture over top of cake and generously sprinkle with praline. 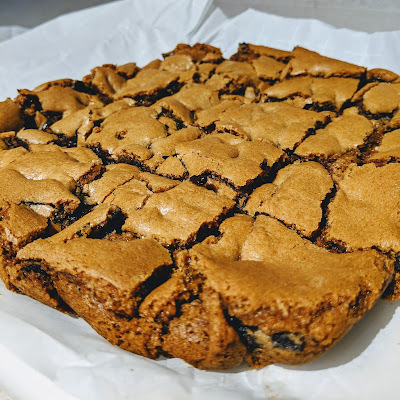 I needed a recipe to use up some chocolate chunks, and went searching for a good blondie recipe. The flavor of the brown butter elevates these cookies to possibly the best thing ever, ever, ever. Ahem. Make these. Add chocolate chips or chunks or don't but make them today. Adjust oven rack to middle position and preheat oven to 350°F. Grease pan with butter. Place butter in a small saucepan over medium heat. Cook, stirring occasionally, until melted. Continue to cook (the butter will foam) until it is fragrant and a nutty brown color. Take off the heat and pour through a sieve into a large bowl. Let cool to room temperature. Add brown sugar to bowl with butter and whisk until smooth. Add egg and vanilla and whisk to combine. Stir in dry ingredients until just incorporated. Pour batter into pan and smooth top. Bake until a cake tester inserted into the middle comes out clean, 20-30 minutes. Let cool at least 15 minutes before cutting. I was feeling baking ennui and came across an Instagram story from Deb at Smitten Kitchen about everyone making her salted peanut tart, in tart or bars form. I went through my mental inventory and realized I had all the ingredients, even the plain sour cream she recommends serving with it. Unlike the other recipes I'd encountered in books that would require a trip to the store for one essential ingredient each, this would only require me walking to the kitchen. Sold! I made one random change - I have this giant bag of peanut flour that I bought ages ago to try out as another option for lower carb baking. I replaced half the flour with it, and it made everything extra peanutty, but I actually found that distracted from the top layer's flavor. I used golden syrup and light brown sugar because that's what I had on hand, along with exactly two cups of roasted salted peanuts! You could also make this tart as bars! Line an 8×8-inch square baking pan with two pieces of parchment paper, each extending up two sides. Press the crust dough evenly across the bottom and 1/4-inch up the sides of this pan. Parbake at 350 (no weights or freezing required) for 15 minutes, until very pale golden. Continue with topping as written; topping baking time is the same as tart. Once cool, cut into 16 square bars. Make the crust: Combine the flour, salt, and sugar in the bowl of a food processor. Add butter and vanilla to the bowl, then run the machine until the mixture forms large clumps — just keep running it; it might take another 30 seconds for it to come together, but it will. Set a marble or two of dough aside, and transfer the rest of it to a 9-inch round tart pan with a removable bottom set on a large baking sheet (for drips and stability of use) and press the dough evenly across the bottom and up the sides. Transfer to freezer for 15 minutes, until solid. Parbake crust: Once firm, prick all over with a fork. Coat a piece of foil with nonstick spray, and press it oiled-side-down tightly against the frozen crust, so it is fully molded to the shape. Bake tart with foil (no pie weights needed) for 15 minutes, then carefully, gently, a little at a time, peel back foil and discard. If cracks have formed, use the marbles of dough you set aside to patch it. Return to oven for 5 minutes, until just barely golden at edges and dry to the touch. Set aside. Meanwhile, make filling: In a medium saucepan, melt butter over medium heat and continue cooking it, stirring frequently, until it smells nutty and brown bits form at the bottom of the pot. Whisk in brown sugar and golden syrup or honey and cook at a simmer, whisking constantly, for one minute. Pour into a large bowl, scraping out all of the browned bits from the pot that you can, and place in the fridge or, as I did, on your very cold patio, for 10 minutes, until it has cooled somewhat. Whisk in apple cider vinegar (with cuts the sweetness and adds complexity, not a vinegary flavor, promise), vanilla, and eggs, one at a time, then stir in peanuts. Bake tart: Pour filling into prepared tart shell, top with a little flaky salt, if you wish, and bake for 23 to 28 minutes, until just faintly jiggly in the center and golden brown all over. Cool on a rack to room temperature, or, like me, you can rush this along in the fridge, but don’t let it fully chill. Serve: Decorate (if you wish) with powdered sugar. Serve in wedges at room temperature (not cold, which can be too firm) with a dollop of sour cream.